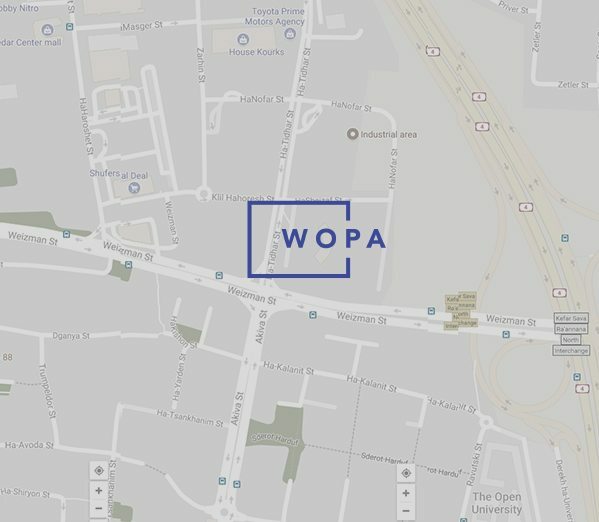 WOPA is an innovative concept that changes workplaces environment by placing startups, in the beginning of their journey alongside companies with vast experience, generating ONE Community. We provide our members with the perfect ecosystem to grow in, as well as work spaces solutions & all-inclusive services, creating a work environment made of the climate, the culture, and the conditions allowing creativity to blossom. Research has proven co-working spaces increase workers’ motivation and engagement, enable collaboration and assistance, expand members’ professional network and encourage personal and business growth. No matter if you are a one-man-show freelancer, a two people startup or a corporation with hundreds of employees, at WOPA we will tailor a solution to your exact requirements, and enable your company to enjoy the best of co-working. Join the WOPA effect and take your business to the next level.